The Meguiar`s Hybrid Ceramic Wax is an Sio2 based, easy to apply, spray on protection product! The unique chemical makeup of water-based Silica Dioxide makes this formula, once cured, a protective layer that adds gloss, and protects various surfaces from the elements. You can use this product on glass, plastic, metals, fiberglass, vinyl, paint protection film, wheels, and so much more. The no buff application (spray on, rinse off and dry) helps you save valuable time and reduces the chance of adding imperfections into the paint. The SiO2 molecule integrated into a polymer matrix provides a hydrophobic effect, extreme gloss, UV protection and a slick surface. This keeps your vehicle protected for months, not days and really the gloss turns heads. Grab the Meguiar`s Hybrid Ceramic Wax if you are looking for an easy to apply, Sio2 based protection product! I just ordered a bottle of this on Tuesday, hoping it ships out soon so that I can play with it. Also ordered their ultimate waterless tire dressing/wheel cleaner. Might snap some pictures and throw a review thread up. I`m looking forward to hearing results, a third layer cant work right. I imagine a bunch of marketing guys sitting in a board room with half of them yelling, "It needs to say coating!" and the other half saying, "Consumers know wax!" and after hours of debate someone`s like, "Fine! We`ll call it Ceramic Wax!!" It`s in, it`s blue, it`s definitely thicker than Wet Coat/Hydro2, and it actually smells delicious! Really looking forward to trying this out, 26oz could prove to be a great value. Be sure to check out he how to on the Meguiar’s forum for your review. Looking forward to the video. Used this on my neighbors suv and followed directs for initial application it is thicker and blue really no problems. It was 50 I my garage when I did wash and application, how long it will last time will tell. I have a couple of neighbors who are not able to take of their cars so I try and help out.I call these my experimental products car, I use products like the spray on wipe off products for ease of use on myself and see how they hold up. Video`s live! 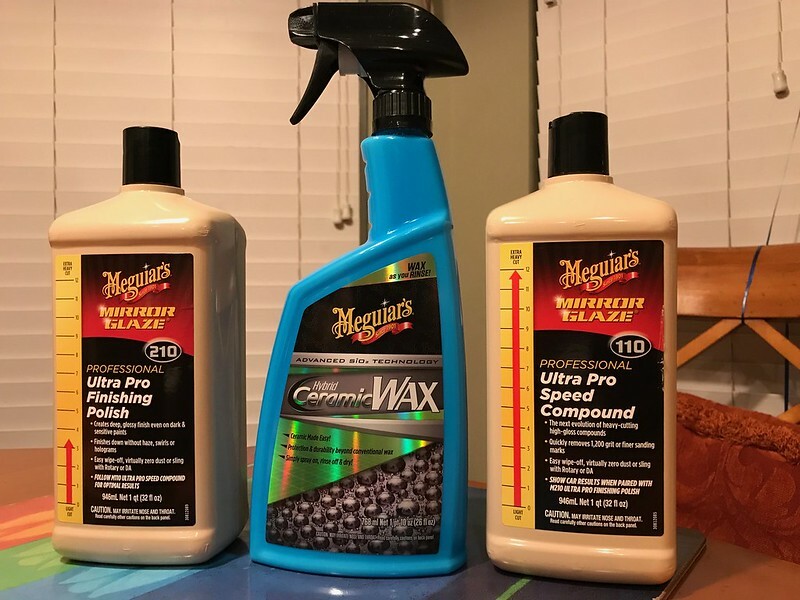 I really think Meguiar`s knocked it out of the park with Hybrid Ceramic Wax at this price point for 26oz. I saw this announced and I automatically assumed it would be much more of a Hydro2/Wet Coat clone but they`ve changed it up enough to where it seems like a unique offering in the spray and rinse category and it really does smell Mirror Bright delicious. In the video I probably overstated the thickness, with Hydro2 and Wet Coat you can lightly "mist" it on the paint if you want to. HCW you`re not going to get a mist you`re going to get a spray - which works fine. 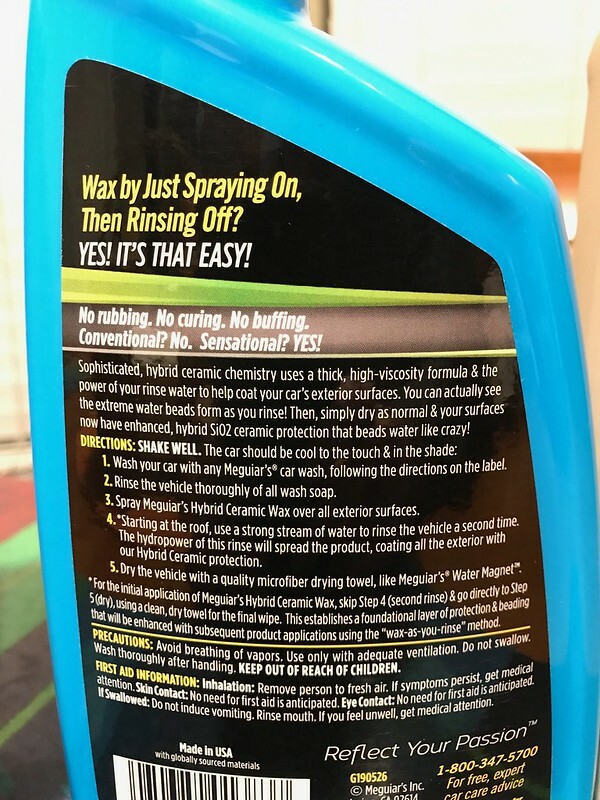 Meguiar`s recommends a spray and dry initial application, you can do this but the next time you go to rinse, this layer of HCW still takes some time to activate, you don`t get instant beading it still wants to be rinsed thoroughly. But the spray and towel wipe method is a great way to ensure total coverage while being more conservative and ultimately using less product. I did try spraying it on fully dry paint and working it into the panel and it did work, I was able after some extending buffing to get it to wipe clean visually, which isn`t something I could ever do with Wet Coat or Hydro2. I still don`t recommend a dry application, I didn`t notice a stronger bond as it seems to bead just as well wiping it in on a wet surface after the rinse. I will keep an eye out on the funky grime issue that can occur with Hydro2 on the wheels where it seems like grime is latching on easier, also for any streaking issues but nothing noticed so far in the short term. Watched this vid earlier today. Seems too easy. Would it harm a LSP like FK1000P or would a two step like this be redundant? I`m going to be checking this out. FK1000P, Fusso Coat, Zymol waxes; these are all more hydrophobic in the short term so I`m interested to see if HCW is going to be boosted by their performance underneath, or if HCW is going to reduce their performance by being on top. Ultimately FK1000P will end up needing to be maintained at some point so I would think this would be a great option as a topper if you like the spray and rinse format. But I will confirm if I notice any topping issues in the short term. I like that he mentioned wiping it on for complete coverage. This really applies to all of the products in this category. I use a damp mit and spray both the mit and the surface to spread it around evenly. Wheels is the only place where I just spray the faces. How does this product look on glass? Are they using it on windshields? I can see possible problems coating rubber windshield wipers and associated buildup. Once you get these products on glass what do you do to get it off? R U guys going to be able to say where you purchased the Ceramic Wax and maybe the price?? Thanks.